This thread's title is taken from the old TV show "To Tell The Truth"
We have a real Sun-Diver approaching from the Oort Cloud for it's first encounter with the Sun. Most of you are probably aware of what I'm talking about, Comet ISON. above the solar surface on its closest approach, which will take place on Nov. 28." but either way, that comet is going to get really really hot! This event will become more and more prominent in the news as the the hour approaches. Comet Lovejoy took a dive back in Dec. 2011 having spent close to an hour inside the corona. It's closest distance was 120,000 km (74,564 miles) above the stellar surface. Will have to watch and see what happens with the ISON being predicted as the latest sundiver, but this NASA Page has links to videos of Lovejoy shooting in and out of the Corona of the sun during it's event. ISON is still too far out (near Jupiter) for them to get an accurate fix on it's size. I've seen estimates anywhere from twice the size of Lovejoy, to between 1 and 10 kilometers. By mid Summer we'll surely know a lot more about it. Comets are so cool, I've seen about five. but in a moment realized it was a comet. I had not heard any news about it, so it was a big surprise. went out to look, and there he was, this lil mostly black with a little bit of brown, boy puppy. and so I went back inside, thinking she would lead him away, but she ran off and never came back. I have always wondered if she left him there on purpose. Being the dog lover that I am, naturally I adopted him, and wondered what to call him. "here H'yakutake, c'mon H'yakutake, come here boy", so I settled on "Comet"
Comet passed on last March 22/2012, almost exactly, if not exactly, 16 years later. "Comet" is an excellent name for a dog. Good choice. Hale-Bopp was also spectacular the following year. It was those two that rekindled my interest in amateur astronomy. I look forward to seeing ISON. Who is to say what will happen this time, comets certainly make watching the sky interesting. Another comet from the sun grazer family, Comet Encke in 2007, had it's tail blown off by a solar eruption when it was inside the orbit of Mercury. This GIF movie below from NASA's STEREO-A probe shows that event, plus shows some rather cool whipping action in the comet tail. Please pardon this brief aside. In the opening post of this thread, I mentioned how I took the title from the old TV show, "To tell the truth"
For those too young to remember that popular show, (are there any?) I thought I'd give you this glimpse of TV history. 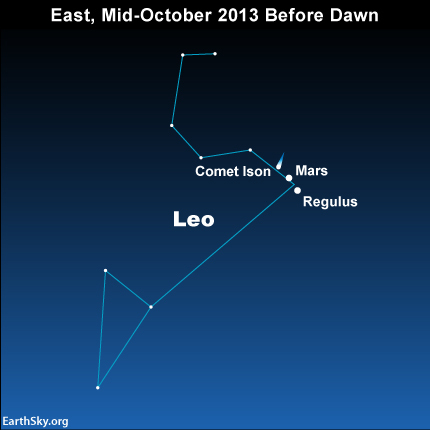 Possible comet impact on Mars on October 19, 2014. Some scientists are hoping it will hit. Link to article that has neat Hubble photos of incoming Ison. Click the photo in the lower left, and more will appear, as well as a video. as it approaches it's Nov 28th Sun dive. If you have a telescope, you can see it over the next week or so, as it will be easy to spot near Mars and Regulus. Look to the East before the sky begins to brighten in the morning. The chart does not indicate the exact date of the positions shown, so you can expect to see ISON move over several days. A story I read a few days ago, had a number of astronomers saying they believed ISON will survive it's Sundive.